Prerequisite: Make sure to read the CredentialsValidationSecurityCheck challenge handler implementation tutorial. The challenge handler tutorial demonstrate a few additional features (APIs) such as preemptive Login, Logout, and ObtainAccessToken. In this example, UserLoginSecurityCheck expects key:values called username and password. Optionally, it also accepts a Boolean rememberMe key, which tells the security check to remember this user for a longer period. In the sample application, this is collected by a Boolean value from a checkbox in the login form. You may also want to log in a user without any challenge being received. For example, you can show a login screen as the first screen of the application, or show a login screen after a logout, or a login failure. Those scenarios are called preemptive logins. If the credentials are wrong, the security check sends back a challenge. It is the developer’s responsibility to know when to use Login, as oppposed to challengeAnswer, based on the application’s needs. One way to achieve this is to define a Boolean flag, for example isChallenged, and set it to true when HandleChallenge is reached, or set it to false in any other cases (failure, success, initialization, etc). Because this security check supports the RememberMe functionality (as therememberMe Boolean key), it would be useful to check whether the client is currently logged in, when the application starts. If the client is already logged-in or is in the remembered state, the API triggers a success. If the client is not logged in, the security check sends back a challenge. The ObtainAccessToken API takes in a scope. The scope can be the name of your security check. Learn more about scopes in the Authorization concepts tutorial. PreemptiveLoginWin: An application that always starts with a login screen, using the preemptive Login API. 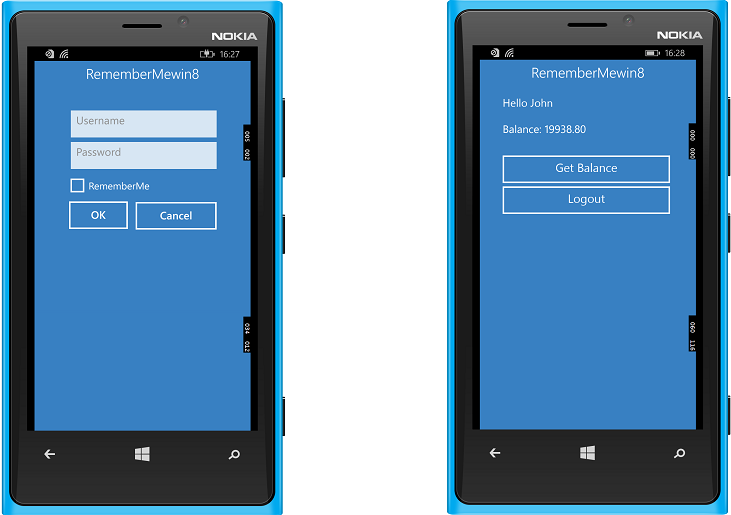 RememberMeWin: An application with a Remember Me checkbox. The user can bypass the login screen the next time the application is opened. Both samples use the same UserLoginSecurityCheck from the SecurityCheckAdapters adapter Maven project. Click to download the SecurityCheckAdapters Maven project. Click to download the Remember Me Win8 project. Click to download the Remember Me Win10 project. Click to download the PreemptiveLogin Win8 project. Click to download the PreemptiveLoginWin10 project. Follow the sample’s README.md file for instructions. The username/password for the app must match, i.e. “john”/”john”.